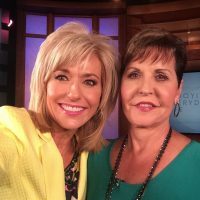 Beth Moore took a selfie with uber false teacher Joyce Meyer while promoting unbiblical unity on Meyer’s show. Today you wrote a letter to your brothers in Christ. Allow me to respond. Be silent. You are not a good Bible teacher. You preach and write about yourself all the time as is if you were a character in the Biblical story. You’re not. You are a character in the farcical and cruel story of the evangelical industrial complex. I read Believing God recently; it was one of the worst Christian books that I have ever read. It pains me to know that so many women erroneously think that you are a good source for biblical teaching. You are not. Let me be clear, you aren’t a terrible Bible teacher because you are a woman, you are a terrible Bible teacher because you are not good at teaching the Bible. That you are a woman is irrelevant. As a woman leader in the conservative Evangelical world, I learned early to show constant pronounced deference – not just proper respect which I was glad to show – to male leaders and, when placed in situations to serve alongside them, to do so apologetically. I issued disclaimers ad nauseam. I wore flats instead of heels when I knew I’d be serving alongside a man of shorter stature so I wouldn’t be taller than he. I’ve ridden elevators in hotels packed with fellow leaders who were serving at the same event and not been spoken to and, even more awkwardly, in the same vehicles where I was never acknowledged. I’ve been in team meetings where I was either ignored or made fun of, the latter of which I was expected to understand was all in good fun. As a seminary graduate, male or not, it has been one of my great joys to collect submissions from women who have rejected you and your Bible studies. The most popular article I ever published was a testimony from a pastor’s wife about how awful your teaching is. You are utterly unqualified to do what you do. Yes, you are popular. So are Joel Osteen and TD Jakes. You are successful in a market that demands a horrible Bible-study product and is readily supplied with it. … You scoff at the seminarians who “talked down” to you. Maybe if you didn’t drop out of seminary (like Perry Noble) you would understand why they think you are so awful. Here is a hint, it is not because you are a woman. It is because you are awful. That my writing and blog-editing has kept others from your products makes me happy. It is to his shame that John Bisagno did not shut you down when I was still in pull ups. Instead, he did what many mega-pastors do, he went with what drew numbers. Josh Buice, Justin Peters, Matt Slick, Chris Rosebrough, Elizabeth Prata, and Michelle Lesley have all warned about you. I am not personally friends with a single pastor who thinks you are sound. You are showing your true colors lately. As time progresses and the evangelical market becomes more lenient you inch towards egalitarianism. Now you are acting like this big advocate for women. Listen, if you really care about women why don’t you name the person you were referring to when you wrote this? God isn’t talking to you. Stop saying He is. You sound crazy. If God was talking to you, you’d likely not be such a horrible Bible teacher. I’m not saying what scores of other theologians and pastors haven’t already thought. If anyone is wondering “How does this look to lost people?” I hope it looks like a theologian who loves Jesus and thinks Beth Moore is crazy and wants to protect Christian women from Beth Moore. It’s not like Keith Moore has been doing a good job of it.